Title: Picky? Not Me, Mom! Your children are picky about what they eat- especially when it comes to raw fruit and vegetables. They turn up their noses at broccoli and bury their peas under the mashed potatoes. The little tykes just won’t eat what’s good for them. So, what do you do? Concerned parents ask Karla Heintz questions about her solutions and suggestions, together with menu plans and fast recipes for resolving what she calls “picky eater syndrome” are delivered in this practical guide to better nutrition. Picky? Not Me, Mom! covers every aspect of nutrition from tips on consuming more fruits and vegetables, the underlying causes of picky eating and addressing issues of children with too much energy. All suggestions and solutions in this book are practical and immediately applicable. There is no need to rush out and buy exotic foods or embrace mind-bending philosophies. Picky? Not Me, Mom! is a common sense guide to resolving the increasingly common problem of picky eating. Regardless of their age, it is never too early or too late to teach your children about nutrition. Meal times and eating can and should be enjoyable for children and parents alike, Happy, healthy eating! Karla Heintz, BSc is a nutrition educator, consultant and guest speaker for various television stations and CBC radio based in Calgary, Alberta. Karla contributes articles to Alive, Today’s Parent and Calgary’s Child magazines and regularly speaks to health care professionals, athletes, parents and children on the topics of health, nutrition and wellness. Her interest in children’s nutrition originated from a children’s food camp for which she created a number of recipes, menu plans and food-related games. I wish I would have read this book sooner! My oldest girl is an EXTREMELY PICKY eater and after reading this book, I realize that I have been doing everything wrong! This book has taught me so much about kid’s nutrition and made me understand how I should be going about getting my kids to eat healthy. I liked how it was written in plain English and easy to read format. The author is very good at explaining the strategies and giving examples of how to get your kids to eat better. I feel so much more informed now after reading it and will definitely be referring back to this valuable guide. The recipes in it are easy to make and fun and I can’t wait to try more of them. 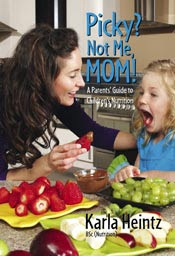 If you have a picky eater, then you need to read this book! To purchase or learn more, please visit Nutrition with K website.